Wente has two locations in Livermore; their vineyard on Arroyo Road and the other on Tesla Road. 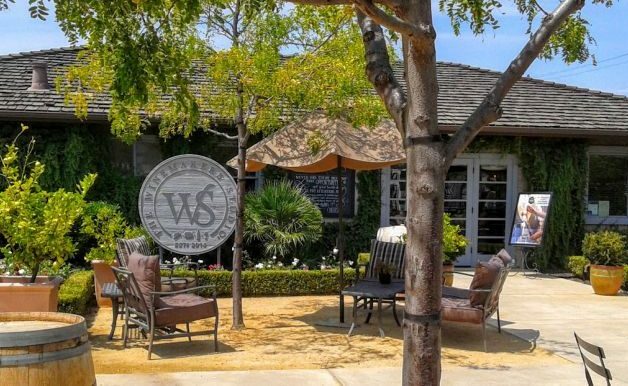 We toured the Winemakers Studio, which is at the latter location when we visited Wente for the Alanis Morrissette concert. The Tesla Road location offers three distinct tasting rooms. 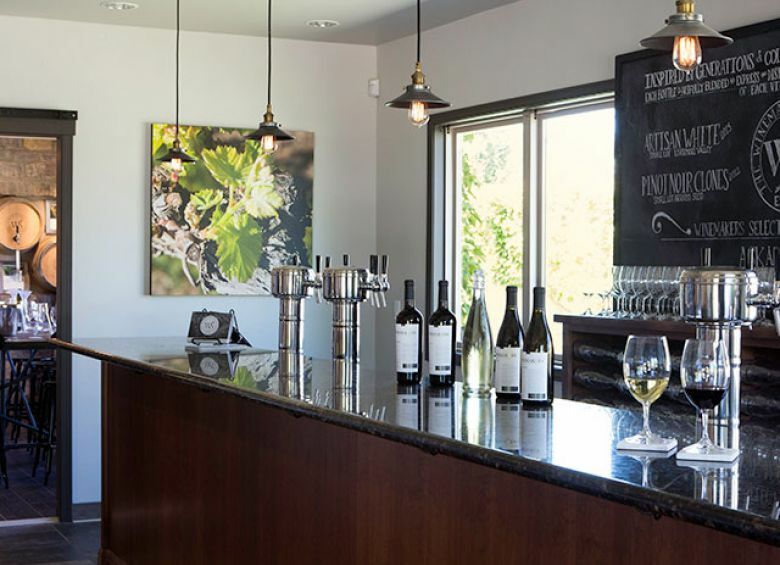 The Estate Winery is open to the public daily between 11 am and 5 pm. The Nth Degree Lounge is open at weekends for members of the Wente wine club. 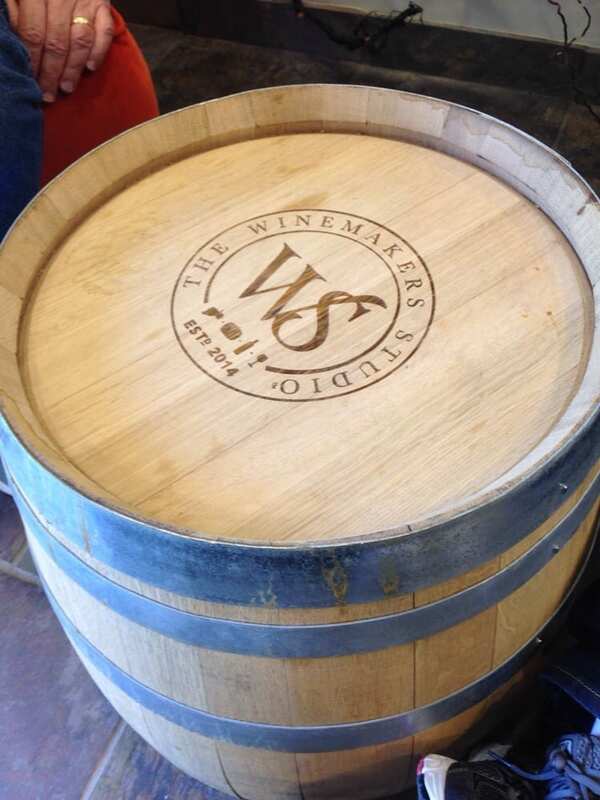 The third of these facilities, The Winemakers Studio is the focus of this article. The Studio was opened just three years ago. 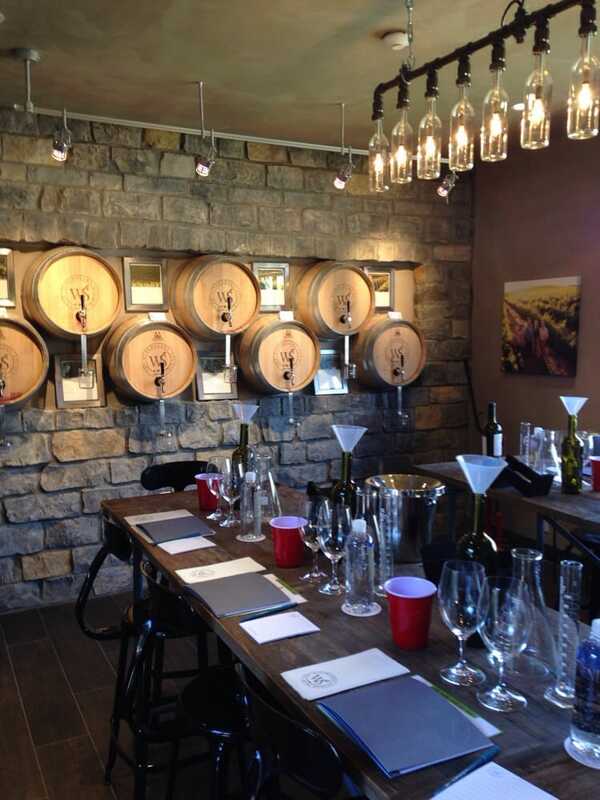 The Winemakers Studio has a bar which offers tastings of small lot wines that are not available in the general tasting room or at retail locations. Based on the Sparkling Brut and the “Pinot Noir Clones” that we tasted, the studio is worth a visit for the tasting, but it is not these exclusive wines that make the studio a unique experience. The Winemakers Studio offers a range of classes designed to educate customers about wine in a nonintimidating fashion. California Girl Comments: I was so impressed with the wines at the Winemaker’s Studio. I especially enjoyed the sparkling wine. 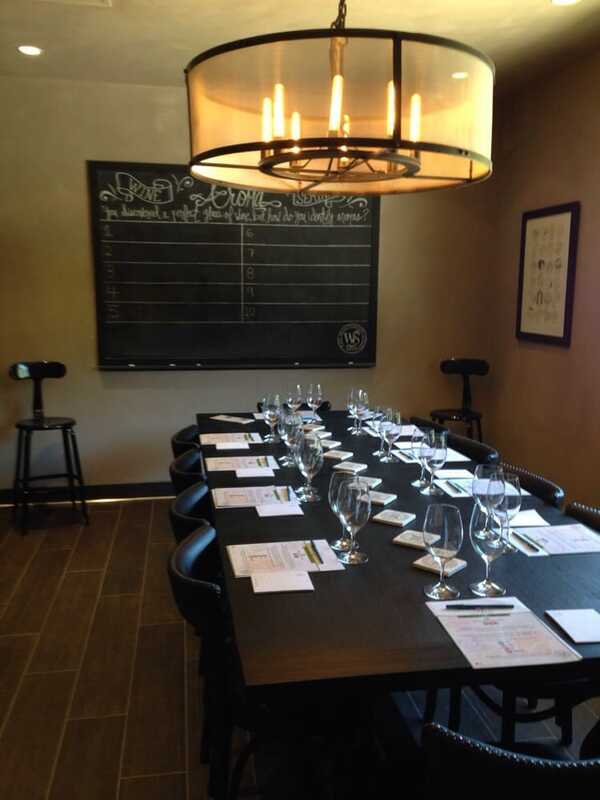 One of the classes on offer has its own dedicated room; the Winemakers Blending Experience. Along one wall are several barrels; four of which contain different Cabernet Sauvignon, the rest with wine to blend with those Cabs. On the table were the necessary tools to measure and taste the wines, as well as a notebook and pens. Once you have blended your wine, you bottle it, add cork and foil, and then label it. The wine is yours to take home and drink. 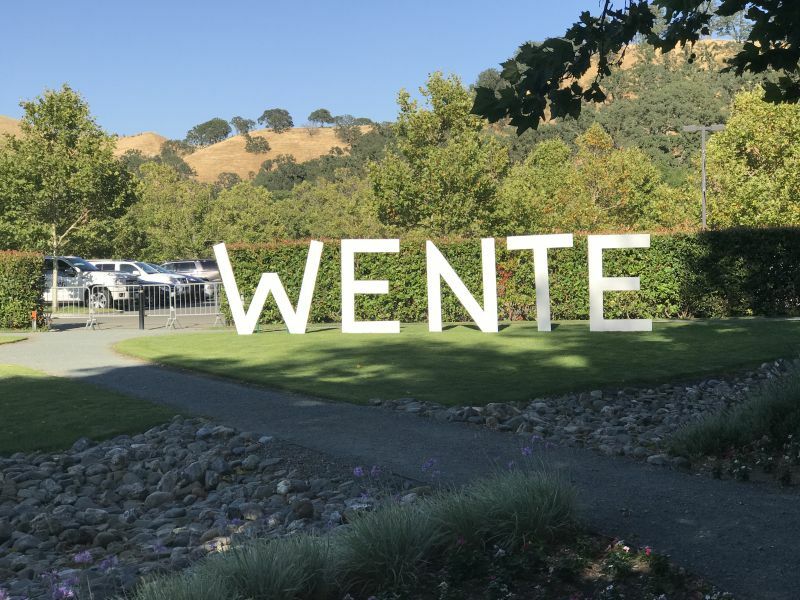 We have blogged about a similar experience at Conn Creek, but at $95 the Wente offering is significantly less expensive. California Girl comments: I’d love to add this experience along side our experience at Conn Creek. Another of the classes that sounded intriguing was the Wine Aroma Discovery. In this session, you are provided various fruits, nuts, and other substances whose odours are often identified in wine. You smell these and then are provided with wines which share those aromatic characteristics. Writing for this blog, I have found that taking the time to identify the smells and flavours has increased the pleasure I obtain from wine tasting. I think this class would be a great way to get more from wine tasting. This class costs $55. California Girl comments: I loved the idea of this class. So many people ask us how we get our tasting notes when we are talking about wine. This is how people in the wine business train their noses and taste buds. 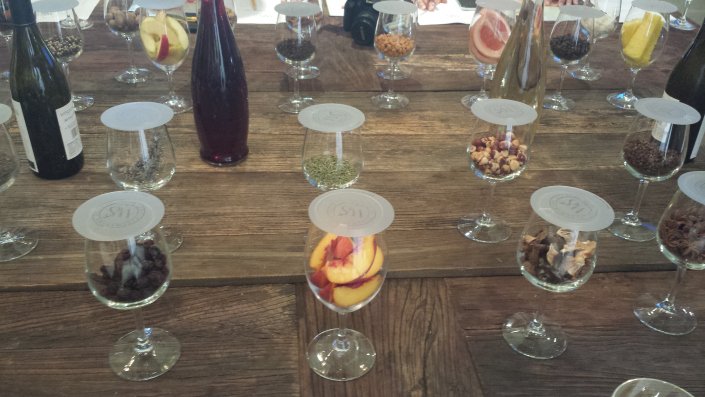 They spend their time committing these scents and flavors to memory and then tasting wines. Once you start doing it, its amazing how much more you can detect. This class teaches you to focus on what you are tasting. It’s a great thing for those who are interested in learning more about wine. The third education experience offered at the Winemakers Studio that I wished to highlight is the black glass blind tasting. For this class wine is poured into opaque black glasses, making it impossible to see the color. All of the wine is served at the same temperature. The challenge is to identify the colour by taste and smell alone. I cannot understand how it is possible to fail this test, but without sight and temperature as a guide, it is not straightforward to recognize red from white. If you feel that this could be embarrassing, it is worth noting that experts at Wine Spectator magazine tried this experiment and struggled.This class costs $35. California Girl comments: This class I have to do simply because I have a hard time believing wine professionals would struggle with this task. I get it for novices, but how fun would it be to try and guess better than Wine Spector Magazine? We hope to attend some of these classes first-hand and write about the experience.